This past weekend was my husband's 45th birthday so being the good wife that I am, I made him pack the car and get behind the wheel for our first spring road trip of the year. Who wouldn't want to drive three hours in order to look at a view like this on your birthday even if the kids were unhappy for a third of the journey? Mr. Piggybank usually protests trips on his birthday because you've heard me say before that he prefers saving money over spending money so he kindly requests that we don't splurge on luxury hotel accommodations anywhere near his birthday. In other words, he doesn't want his birthday to cost him a dime and that usually translates to "he wants to keep his fanny at home!" But this year, we had some family obligations that took us in a different direction. Three hours east to be exact. Our destination was to North Carolina's third oldest town. The lovely and historic Beaufort, NC, established in 1709. Beaufort is a quaint rocking chair type town. It's a place where you want to stroll on the docks. And see who exactly boards this yacht. Beaufort has so much charm. I can't even begin to capture it in my amateur photographs. The homes! I could walk for hours looking at the homes in this picturesque town. If you like to tour homes then you should plan a trip for this year's 51st annual Old Homes and Garden Tour held every June. This year, the event will be June 24-26. I used to go every summer before having children, but touring homes with them just doesn't have the same appeal that it once did. Eventually, I'll get back on the circuit. 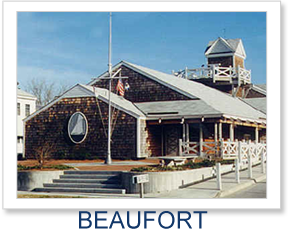 Beaufort is also home to the NC Maritime Museum. For 270 years, Blackbeard's ship was hidden off the coast of NC by sand and water. In 1996, the pirate's ship was found and the museum has had a small exhibit with some artifacts. But this June, exciting things are sailing ashore. Blackbeard's flagship will sail in Beaufort again. June 11, 2011 will be family day at the museum. What's our connection to Beaufort, you ask? Why it's Tractor Hines, of course. Mr. Piggybank's dad. Granddaddy Tractor lives in Beaufort and Pine Knoll Shores, NC. We get to stay in his guest house in Beaufort. For the record, he no longer has a tractor, but he did ten years ago when my nephew christened him with that name. It's funny how names stick! My computer time is over, the kids need attention, but our road trip is far from over. There's more to come this week. Stay tuned for my next post, "One Wedding and a Fort". We'll also finish the week with a wonderful Beaufort recipe that will cure any sweet tooth you may have. Until next time, I'm off to compile a list of hotels for your own road trip to Carteret County, and the beaches near Beaufort.